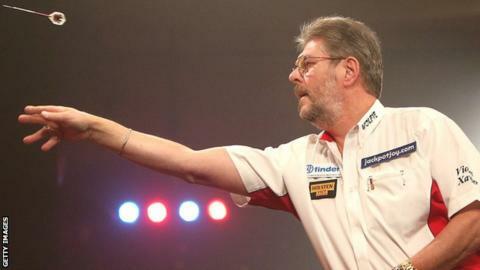 Martin Adams says his dedication to practice is helping him produce some impressive displays at the BDO World Championships at Lakeside Country Club. The 58-year-old is into the final four for the 10th time in his career. His last semi-final appearance was in 2011, when he went on to win the third of his world titles. "I've done it [returned to form] myself with a lot of hard work and a lot of practice over a period of about two years," said Adams. "He's always been a fighter. He always produces the darts when he has to do it. Montgomery was finishing well and very tidy, but Adams didn't let him in. He bullied him a little bit and didn't give him a chance at the doubles. He scored well and took the shots out when he needed them." He told BBC Sport: "Every afternoon at half past two, if I'm not doing exhibitions or at tournaments, I'm on the practice board for two hours." Lincolnshire-based Adams, who was also world champion in 2007 and 2010, endured a difficult couple of years on the oche but he now appears to be back to somewhere near his best. Three ranking tournament victories in 2014 led him to be seeded third at Frimley Green, and a 5-1 win over Scotland's Ross Montgomery on Friday confirmed his semi-final spot. Montgomery took the fourth set to a deciding leg but he could not level the match at two sets all and Adams went on to record a comfortable victory. "I've ridden my luck a little bit, but when I've needed to do what I've needed to do, I've gone and done it," said Adams, who is making his 22nd consecutive appearance at Lakeside. "The one good thing I'm pleased about today is that I hit some doubles without mucking about. "It was nip and tuck but I guess that's because we're good mates. We both want to beat each other, but we've got the greatest of respect for each other at the same time." Read more on BDO World Championships: Can Jeff Smith emulate hero John Part?